Any business with a need to reach a broader audience must have a robust, reliable, and scalable email delivery system. Email is the most prevalent communication platform in the world. According to a study conducted by Radicati, 3.8 billion people are using email today, and that number is predicted to exceed 4.2 billion in 2022. SparkPost, an AWS Partner Network (APN) Advanced Technology Partner with the AWS Marketing & Commerce Competency, helps big email senders like LinkedIn, Pinterest, and Zillow deliver billions of emails to customers every day. All in all, SparkPost customers send more than five trillion emails each year, including more than 37 percent of the world’s business-to-consumer email messages. Building an email delivery system that is rich and reliable enough to address your business needs can get both resource-intensive and time-consuming. If you have a goal of sending thousands or even millions of emails per day, you have to surmount a number of issues to make sure your emails reach your target audiences’ inboxes when you want them to. Email deliverability can be tricky because of issues like email security and authentication, spam blacklists, and a wide range of Internet Service Provider (ISP) rules that can prevent your emails from getting delivered. In addition, without data on your deliverability and performance statistics, you have no insight into which components you need to change to improve your email marketing strategy. For example, knowing the number of email bounces during a campaign is important because an ISP can flag you and degrade your performance on the receiving side, which impacts your deliverability in the future. Finally, there’s the issue of having to scale your infrastructure so you can successfully send the number of emails you need to without delay during a huge and time-sensitive marketing campaign. Given these challenges, companies of every size opt to offload the core components of an email delivery system to an established email delivery service. SparkPost offers an API-driven email delivery service that comes with a built-in email analytics platform. Because it runs on Amazon Web Services (AWS), SparkPost inherits the AWS Cloud’s reliability and scalability, which makes it equipped to handle customer demands at varying levels of activity. To put this in perspective, SparkPost customers send 20 billion emails every month. This includes big email senders like ZipRecruiter and the Financial Times. ZipRecruiter, one of the fastest-growing job posting services today, sends 20 million emails each day and relies on SparkPost to achieve the performance and email deliverability rates that they require in order to serve their customer base. The Financial Times has hundreds of thousands of digital subscribers and maintains customer engagement largely through email that requires heavy data analytics. SparkPost’s APIs and analytics capabilities serve these requirements, and the Financial Times sends most of their subscriber emails are through the service today. The Transmission API is the core endpoint that allows you to send email. Each transmission can send email to a single recipient or many thousands. SparkPost generates and sends messages using the options you’ve defined, including recipients, message template, personalization or other data, and engagement tracking to help you control how your emails are sent. The Metrics API provides endpoints that allow visibility into your data, as well as filtering mechanisms that let you search for more specific information. 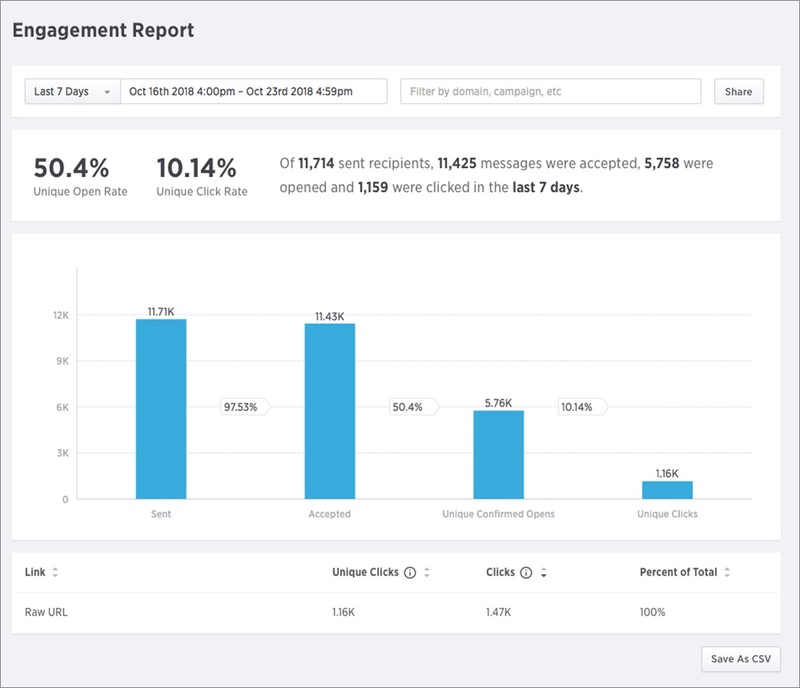 The Message Events API gives you access to data on recent events, including email delivery status and recipient engagement metrics such as opens and click-throughs. The Webhooks API sends raw data collected directly to your application by sending a POST request to your target URL. Many of these functionalities are invokable with SMTP, and with proper configuration settings, you can take advantage of SparkPost’s features through any application that sends email via this protocol. SparkPost collects an enormous amount of real-time data about the emails you send through the service. It allows you to track your email transmissions and collect over 40 different metrics throughout their lifetime. Metrics include sends, bounces, renders, opens, failures, and rejections. In addition to the ability to retrieve metrics using APIs, SparkPost provides an analytics dashboard that lets you query and filter your data without programming knowledge. It also allows you to create interactive visualizations so you can more easily identify trends and patterns at a glance. Figure 1 – SparkPost collects real-time data about the emails you send. 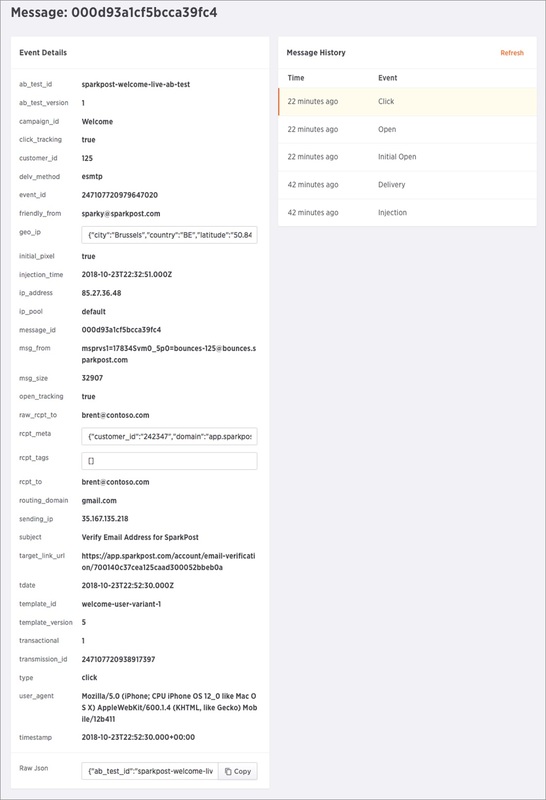 The SparkPost Webhooks interface allows you to push webhook events to your own endpoint for processing. You can retrieve event-level data through the Message Events API. These describe the lifecycle of a message (transmission), including injection, delivery, and disposition. Figure 2 – SparkPost offers a webhook interface, which allows you to send event-level data to your own endpoint. These provide insight into message creation failures or rejections. These describe what recipients “do” with your email, such as opens (renders) and clicks. Figure 3 – SparkPost helps visualize recipient engagement data through its reporting tool. SparkPost also has native libraries for most popular languages, including NodeJS, Python, PHP, C#, Java, and Go. APIs make integrating email delivery functionalities with your application simple and can save businesses a lot of developer time and resources. 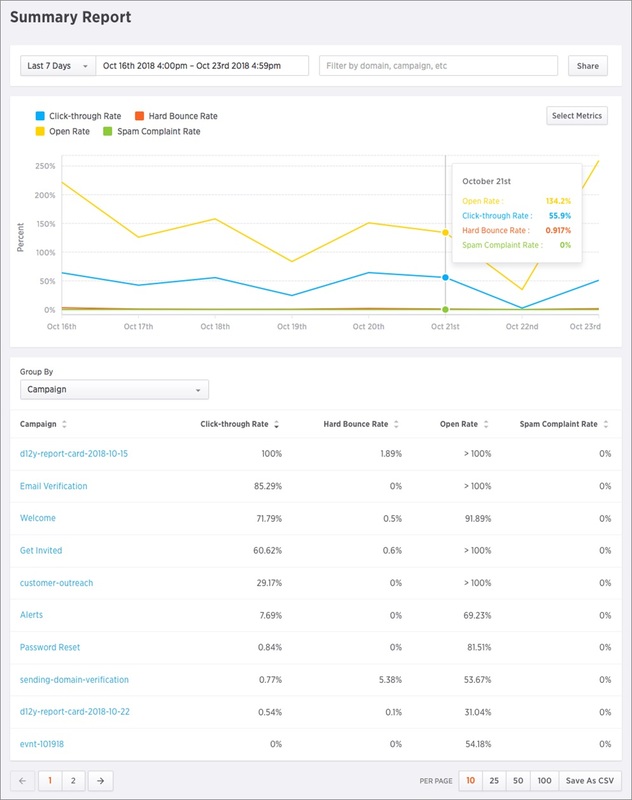 Built-in analytics allow you to gain insight into deliverability and email performance statistics so you can make informed decisions. Because it runs on AWS, SparkPost inherits the reliability and scalability of the AWS Cloud. This improves the ability of big email senders to ensure engagement with growing numbers of customers without scalability challenges. SparkPost provides an array of documents to help you with getting started, integration, using client libraries, email deliverability fundamentals, best practices, and other useful information. Powerful templating, multiple webhook addresses, and multi-account features let you build applications that engage, retain, and rapidly grow your user base. With SparkPost, you can generate and send emails, customize templates, and access your email metrics through a service that inherits the AWS Cloud’s reliability and scalability so that you can retain your engagement with your growing customer base. 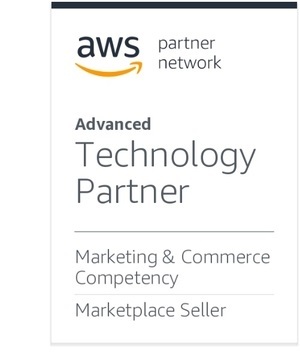 SparkPost is an AWS Competency Partner. Their email delivery service, developed from the ground up to run natively on AWS, helps big email senders like LinkedIn, Pinterest, and Zillow deliver billions of emails to customers every day.